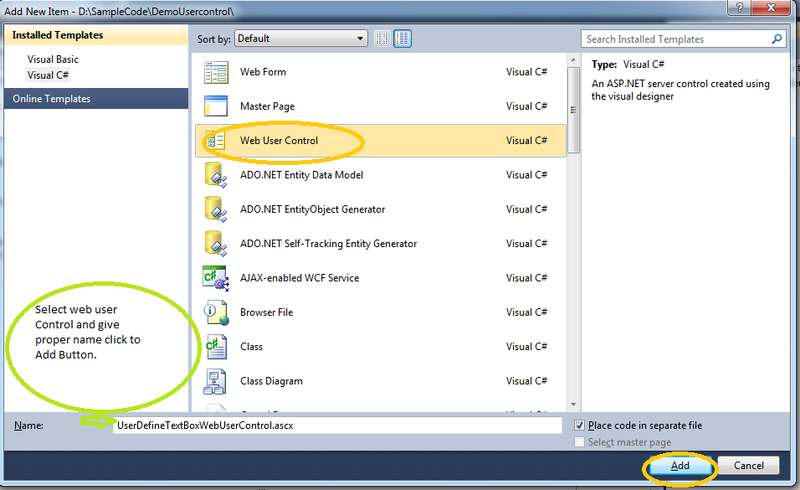 In Asp.Net Web server controls , you can create your own custom, reusable controls using following step. These controls are called user controls. A user control is a kind of composite control that works much like an ASP.NET other server control . you can add existing Web server controls and markup to a user control, and define properties and methods for the control. You can then embed them in ASP.NET Web pages like same as other server control. Step 1: First of all add one folder in your website or project for contain all user control as follow screen. Step 2:Right Click on folder in which you want to contain usercontrol as follow screen. Code For Simple Text box control make as userdefine control you set property once in user define control then you no need to write again only need to register control on your page and use it. Following code in .ascx page. <asp:TextBox ID="TextBox1" runat="server" BackColor="WhiteSmoke" BorderColor="ActiveBorder"
Font-Bold="true" Font-Size="X-Large" ForeColor="Aqua" Height="70px" TextMode="MultiLine" runat="server"
Now your control is ready to use. This way you can make any server control to your own control such as linkbutton, Dropdown, checkbox, radiobutton, etc.